The Earth is full of glorious proofs of Creation. 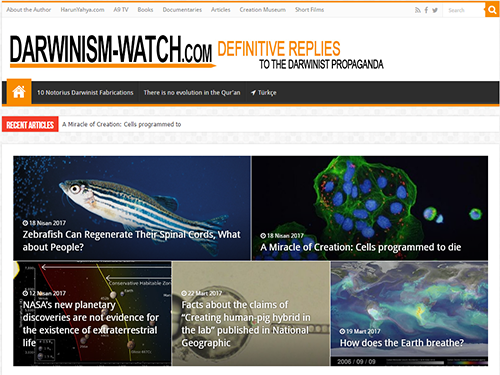 • Darwinism has never been scientifically proved; on the contrary, it has been refuted by the scientific evidence. 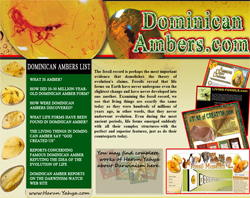 • For that reason, efforts have been made to use frauds to keep Darwinism alive. • Darwinist frauds have been ignored by Darwinist scientists. 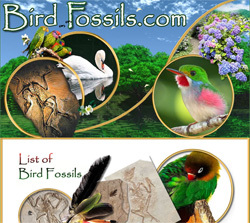 • False fossils have even been exhibited in museums as evidence of evolution for years after their exposure as hoaxes. • Despite being aware of the true nature of frauds, Darwinist scientists have taught them to students as scientific evidence proving evolution. 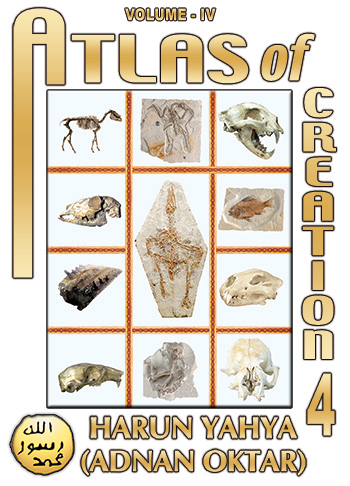 • Darwinist scientists have sought to ignore the scientific facts that refute Darwinism and prove Creation; the greatest proof of this is the way fossils have been hidden away. • Darwinism has tried to give the impression that human beings are simply a species of animal, and has had no compunctions about using fraudulent embryo drawings for that purpose. But what is the reason for these astonishing endeavors, even encompassing fraud? Why should Darwinists have gone down such a difficult path, rather than admitting the truths revealed by the scientific facts and abandoning Darwinism? Why do they go to such lengths to give the impression that the theory has been established, and why do they put so much effort and time into propaganda, fraud and deception, even though it is a manifest fact that the theory of evolution has not been proven scientifically? Why is it that Darwinist scientists have so insistently come up with lies on behalf of the theory of evolution and had these lies taught in schools, even though they know they will be humiliated and their frauds exposed? There is only one answer: Darwinism is not science. Darwinism is a heretical religion. It is a hollow and superstitious belief system. It is an ideology built upon fraud. That is the reason for all these Darwinist endeavors, their blind devotion to this heretical religion and the way they strive with all their might to keep their superstitious beliefs propped up. In Darwinists' eyes, everything necessary to that end must be done. 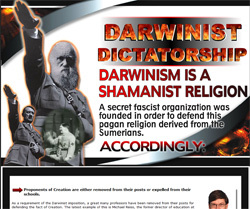 If this superstitious religion is abandoned, Darwinists will have to accept the fact that Allah creates all things and thus relinquish their false faith, and such a thing is unacceptable to the twisted Darwinist mindset. 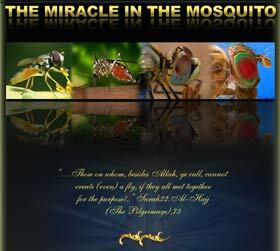 The fact is, however, that belief in the existence and oneness of Allah, and love of Him, is the cause of enormous joy. Belief in Allah is a blessing that increases one's reason and powers of understanding many times over and bestows a wondrous profundity on the soul. The methods that Darwinists resort to , on the basis of their own base mindsets, in order to deny the manifest existence of Allah merely makes them wretched, ruthless, fraudulent and illogical. This admission by the Darwinist Pierre Paul Grasse is an expression of a secret understanding among Darwinist circles. Since, under the system of the dajjal, Darwinism cannot be denied in any manner, and a blind eye must be turned to fraud, deception and lies. "One can have a religious view that is compatible with evolution only if the religious view is indistinguishable from atheism. "107 Will Provine, atheist and evolutionary biologist and geneticist. "Evolution … helps atheists defend their own existence, and still be consistent with their 'religion' of a godless universe. 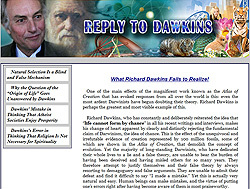 "108 Richard Dawkins, evolutionary biologist and atheist. "In fact, evolution became, in a sense, a scientific religion; almost all scientists have accepted it and many are prepared to `bend' their observations to fit with it. "109 Darwinist and Manchester University Professor of Physics H. S. Lipson. "My attempts to demonstrate evolution by an experiment carried on for more than 40 years have completely failed… The idea of an evolution rests on pure belief. "110 The well known Lund University scientist Heribert Nilsson who spent his whole career trying to create supposed artificial evolution among living things. "The law of natural selection is not, I will maintain, science. It is an ideology, and a wicked one, and it has as much interfered with our ability to perceive the history of life with clarity as it has interfered with our ability to see one another with tolerance. 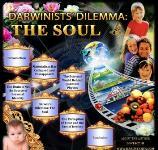 "111 The Darwinist Kenneth Hsü, earth sciences expert at the Swiss Federal Institute of Technology. One of the thousands of false illustrations that Darwinists fabricate to brainwash people and cause them to believe in a deception. 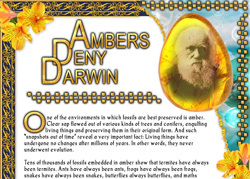 These confessions by world-famous Darwinists certainly point to one highly significant truth. Darwinists are united in maintaining this fraud, using a silent language, even though they know that the ideology they espouse is fraudulent. Occasional statements that serve as admissions change nothing in terms of their devotion to the superstitious religion of Darwinism, and the system is continuing just as it always has over the previous 150 years. There is no end to the frauds deliberately perpetrated, nor to the lies that aim to keep the superstitious religion of Darwinism propped up. The following admission by Colin Patterson, a senior paleontologist at London's Natural History Museum, who died in 1998 and devoted his life to the support of this false theory, is thought provoking in terms of illuminating the deception in which Darwinists find themselves. 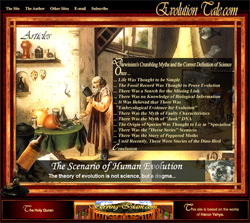 There are hundreds of books about evolution, filled with specious facts, under the control of the Darwinist dictatorship on the market today. This confession by Colin Patterson clearly reveals that Darwinists see nothing wrong in hiding a fact they know very well throughout their lives, and dedicating themselves to a lie. All scientific circles are in fact well aware that the theory of evolution is a lie. 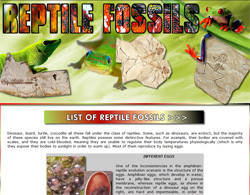 They are all aware that evolution is a deception still taught in schools in order to brainwash students and that all the reports that come out concerning it are deceptive, and that the only purpose behind all the conferences, books that are brought out and countless pro-evolution magazines is to make propaganda. Every single Darwinist knows that the fossils on display in museums of natural history constitute no evidence for evolution at all. 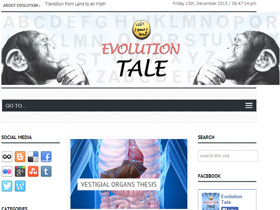 They are aware that reports that a "new proof of evolution has been discovered" are false and that the reconstructions of evolution in papers and magazine are fraudulent. But they behave as if they were ignorant of all this. They try to give the appearance of talking academically as they describe these frauds to one another. But they are all in fact aware that they are supporting a fabricated and false ideology. The reason for all this is that evolution is a belief system, a heretical religion. Evolution has nothing to do with science. Darwinism is supported as a requirement of the war of the dajjal. All those scientists who espouse Darwinism are, albeit unawares, under the control of the dajjal. As Robert Jastrow eloquently states in these lines, Darwinism is taken as a belief system, but the belief in question is a superstitious one, unsupported by any scientific evidence. Materialist thought makes a grave error and utters a terrible lie when it regards the only scientific alternative to Darwinism, the fact of Creation, as unscientific. Creation is the reality to which science points. Scientific findings have time and time again confirmed the fact that all of life is the work of a sublime and almighty intelligence, in other words, of Almighty Allah. On the other hand, all the claims made by Darwinism have been repudiated by all the branches of science. It is therefore a serious mistake, incompatible with the facts, to imagine that anyone who believes in science should also espouse Darwinism. Darwinism is the primary source of the pain and suffering people have suffered for years and such perverse ideologies as communism and fascism. 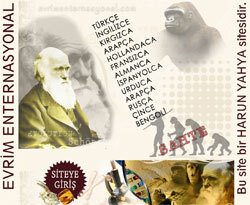 It is most important to realize that Darwinism is not a science, but a superstitious religion. 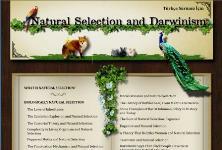 It therefore appears that Darwinism's deception of the world has ideological causes. Every study undertaken on behalf of Darwinism, every step taken in that direction, and every person deceived ever since the theory was first launched is a part of the ideology of Darwinism. The way that Darwinism appears in text books, has spread across just about the entire world, and is the only subject matter in just about all scientific journals, newspapers and the television is no run of the mill matter; this state of affairs is actually exceedingly dangerous. Under the influence of this superstitious religion, people literally regard one another as animals, regard it is legitimate for the strong to crush the weak, and begin to think of man as a chance entity with no responsibility to Allah. The wars, occupations and conflicts that have broken out under the influence of the superstition of Darwinism, perverted ideologies such as communism, fascism and predatory capitalism, and the anarchy and terror that still persist in many parts of the world all clearly demonstrate the scale of the danger. The Darwinist philosophy that has spread oppression across the world for many years is still a threat. The current suffering will only come to an end with the complete elimination of the Darwinist ideological system. It must not be forgotten that the constant propagation of Darwinism, and the efforts being made to ensure it holds the whole world in its sway, are all a struggle being waged against Allah, and that the aim of this heretical ideology is to turn people away from their responsibilities to Allah and make them forget about the Hereafter. It is not surprising that someone who imagines, in his own eyes, that he has no responsibilities toward Allah, and who does not believe in the Hereafter, can ruthlessly oppress others, can regard all kinds of evil as legitimate in his quest for power, can be selfish and incite wars as he regards these as a means to progress, can eliminate vast masses of people or totally annihilate people of different ethnic origins. Young people, many still of high school age, have no hesitation about stating how Darwinist logic poisoned their minds as they took guns to their schools and slaughtered scores of people. They do not conceal the fact that they regard other people as animals, needing to be "weeded out." That is the kind of destructive and savage belief that the superstitious religion that is Darwinism represents. Therefore, when examining the superstitious religion of Darwinism and its deceit which encompasses the whole world, these facts shouldn't be forgotten. It should be taken into consideration that the methods which Darwinists use when deceiving the world are not related to science or any scientific theory whatsoever. It shouldn't be forgotten that the religion of Darwinism has been taken from Malthus's ideas which defend mass starvation, epidemics and wars as a form of population planning; it is the basis of the eugenics ideal, which anticipates to kill all the sick and disabled people; it forms the basic foundation of all the communist and fascist dictatorships which dragged vast masses of people toward death, caused the deaths of tens of millions of people in the First and Second World Wars, and it is the only source which feeds the ongoing scourge of terrorism throughout the whole world . Darwinism can easily turn innocent people into monsters. To the left can be seen the former appearances of these child killers, compared to how they looked immediately before the killings. It must be kept constantly in mind that the starting point of all existing disorder, actions carried out against religious morality by communist and fascist movements, mindless attacks, senseless killings and terrorist incidents in the world today is all one and the same. Darwinism is not an innocent theory developed by science; it is one of the worst scourges of our age dragging masses into moral and spiritual degeneracy, irreligion, irresponsibility, wars, anger and violence. Even though the proponents of Darwin's superstitious religion follow a policy of expansion upon duplicity, everyone in the struggle against Almighty Allah, will be discovered and defeated. Currently Darwinists are witnessing this historic collapse of Darwinism and are watching the situation with great trepidation and regret. [the unbelievers] plotted and Allah plotted. 112. Ben Stein, Expelled "No Intelligence Allowed" belgesel film, 2008.